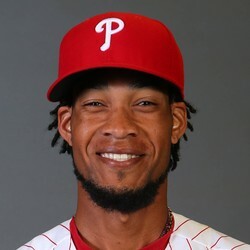 Phillies center fielder Pedro Florimon went 1-for-1 on Saturday but was forced to leave the game early after dislocating his right ankle while beating out an infield single. This didn't look good as the game was delayed for 15 minutes while emergency workers tended to Florimon's ankle. The outfielder posted a .348 average in 15 games for the Phillies but his season is more than likely over.